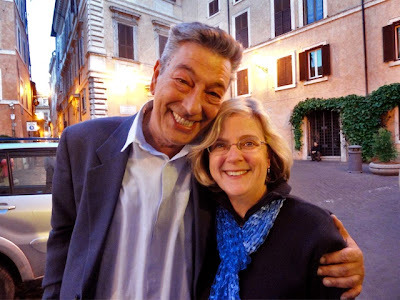 Despite five years of Latin and a lifelong passion for all things Italian, I had never been to Rome until the spring of 2011 when I decided I needed to research a book I was setting there, as well as Tuscany. I have never been able to write about a place I have not actually visited and even the fictitious town of Aleford, Massachusetts where my amateur sleuth caterer Faith Fairchild lives is a compilation of towns I have lived in or know well. The idea for The Body in the Piazza came to me in the shower per usual. I was about to start The Body in the Boudoir, a prequel set in Manhattan—Faith’s bumpy, extremely perilous road to the altar— and it occurred to me that it would be fun to write a sequel. Boudoir starts as the Fairchilds are in a plane on their way to the Eternal City to celebrate a significant anniversary. For almost the rest of the book Faith thinks back to their 1990 momentous meeting in Manhattan and courtship. The ending places her back in the present as they land. Piazza picks it up from there. I enlisted the aid of my friend Valerie Wolzien, author of the Susan Henshaw and Josie Pigeon mysteries, and off we went, leaving behind husbands we knew would not be as entranced as we are with wandering about local markets, darting into enticing little shops, etc. Chapter One of Piazza begins with: Faith Fairchild was drunk. Soused, sloshed, schnockered, pickled, potted, and looped— without a single sip of alcohol having crossed her lips. She was drunk on Rome. Intoxicating, inebriating Rome. This is an exact description of the way Valerie, who had never been there either, and I felt. Prosecco did play a part, but it was Roma itself we fell for—head over heels. Yes, we did gaze in awe at things like the Colosseum, the Berninis in the Borghese, the ceiling in the Sistine Chapel, and Shelley’s last view overlooking the Spanish steps; but mostly we wandered, aided by my uncanny ability to get lost. We also talked to people, including a memorable evening with a friend of a friend who teaches at the University. She invited us to dinner and told us the history of the Jewish section of the city, the Ghetto, where she lives, as did her ancestors. Returning to the area for the best meals we had in Rome, we were haunted by her painful stories. The Fairchilds experience the same mixture. The book continued to evolve as we traveled trip north. Both of us had spent time in this part of Italy, but we were looking at it through a different lens—the crime writer one. We did not attend a cooking school/resort, as the Fairchilds do, but imagination does have to come in to play. It wasn’t hard to dream one of these places up, especially after spending time in Florence’s Mercato Centrale, the city’s trattorias and later exploring the streets of Montepulciano, home of the justly famous Vino Nobile. When we found ourselves far underground below one of the town’s tasting rooms in the maze of tunnels that connects its palazzos, an entire subplot sprang to life. Discovering that there were also grottoes off some of the tunnels, carved from tufa—a soft limestone— and thought to be Etruscan tombs was the icing on the biscotti. Faith locked in…? What if? Pour through a sieve into a pitcher (easier to fill the ramekins this way) and then fill 6 ramekins that you have placed on a tray. Cover with a sheet of plastic wrap and refrigerate for 5 hours or overnight. You can keep the panna cotta refrigerated for up to 2 days. To unmold, run a sharp knife around the edge of the ramekin and dip it in a flat pan of boiling water very briefly. If you overestimate and the panna cotta looks runny, just put the ramekin back in the fridge to firm up again. Invert the ramekin over a small plate and serve. You may also pour all the panna cotta into a bowl, cover and refrigerate before scooping portions out into dessert bowls or martini-like cocktail glasses—very chic. Garnish panna cotta with fruit, especially summer fruits, which can also be made into a coulis to drizzle over and around it. Fresh strawberries with a few drops of balsamic vinegar, honey, lemon zest, ground pistachios, and ginger flakes are all delicious toppings as well. Using this basic recipe, you may try coffee, hazelnut extract, chocolate, even green and other teas as flavoring. For the cardamom version mentioned in the text, use 1/4 teaspoon vanilla extract and 1 teaspoon ground cardamom. Katherine Hall Page is the author of the award winning Faith Fairchild series. The Body in the Piazza is available in hardcover, large print, e-Books and audio. Read more on Katherine’s website or visit her on Facebook. Katherine... this sounds like so much fun, both your trip and the book. I love the cover. That perspective says a lot! Wondering -- have you written about the Jewish ghetto in the book? I've become very interested in a Roman/papal history since Steve and I started watching The Borgias. Have you been watching it? I have little sense as to how much is stretched, but it has my attention. I look forward to reading The Body in the Piazza and trying out the recipe for biscotti. It never occurred to me that a person might make it at home! Oh, yum! Yum for the recipe, for Rome, and for another Faith Fairchild story. I can't wait to read it. We ate at a Jewish Italian restaurant in Philadelphia once that was fabulous (although the name has long escaped). That panna cotta sounds delish! I too, love the book cover and can't wait to dive in. Ooooh, I want to be drunk on Rome, too! This book sounds like so much fun, Katherine - Lucky me I have a copy right here at the top of my TBR pile. Scary cover... I think I went to the top of that tower. This sounds wonderful!!! I have used a recipe for Mandelbrot -- Italian/Jewish? Revisiting beautiful Italy though this book is what I need to do. Maybe the Fairchilds could take a second honeymoon on the Amalfi Coast! 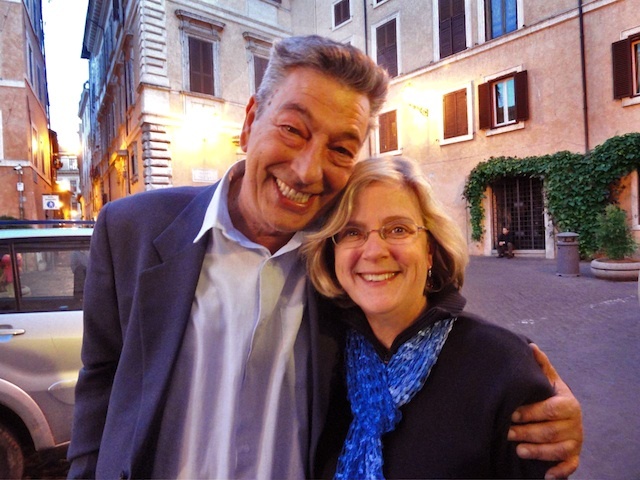 I was "trapped" in Rome last fall when Storm Sandy caused major flight delays. I love that city too, though we never did eat in the Jewish quarter. Katherine, this sounds wonderful. And so envious of your "research". Trips with women friends are the best. PS I second Lucy. What was your favorite meal? I've missed Jungle Reds for the last few weeks...Glad to be back, and to read about your travels and writing, Katherine. That panna cotta looks delish -- I'm no cook but I think I could manage it! Ahhh, Roma! I was there the summer between high school and college with a large study group. My uncle was a priest at the Vatican and took a lot of time to show me and a few friends all over Rome. He took us to dinner at a restaurant that is purported to be the site of Caesar's murder. I'd LOVE to go back again being just a *few* years older and wiser. I am running, not walking, to get this book. I can't wait to read it. Should your books be read in order, Katherine? Hi, Katherine! Waving from KC! The panna cotta recipe looks delicious. I'll have to try it. 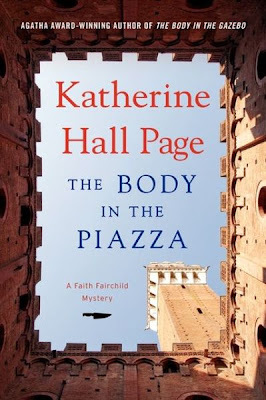 Can't wait to lay my hands on my copy of Body in the Piazza! I've been replying all day to your wonderful comments and have just noticed they don't seem to be posted. 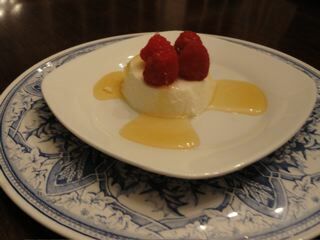 Anyway, yes make panna cotta-easy and delicious! And yes you can get totally caught up in the Borgias! And Rhys, traveling with ladies, yes! Love my guy, but he will not wander the way Valerie and I did-or shop. See some of you at Malice happily and as for Hank, well we know she takes the biscotti! Great news. Almost forgot. The books don't need to be read in order. Some people like to follow changes in the character (she's mellowed, but not much). Others just dive in wherever she is in the book picked up. If you want chronological order, the first book is now The Body in the Big Apple, the The Body in the Boudoir-both prequels-and then the rest go as published. Thanks!